Luiz visited us in Yorkshire for almost a month this Summer. The images shown are quick Plein Air studies, on the go! 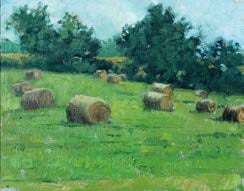 I spent the month of June painting in Yorkshire, England. It is one of the most beautiful places in the whole world and paradise beauty for any artist. 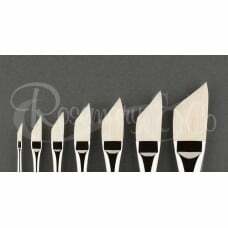 Rosemary & Co Artists’ Brushes hosted two painting workshops in their premises and around the area. The first one with Michelle Dunaway, we were out and about painting the landscape and the figure in the landscape. Michelle was a wonderful adviser, always helpful and sharing her thoughts in art and the life of an artist. A true inspiration! We had a fantastic time painting at Bolton Abbey for two days. 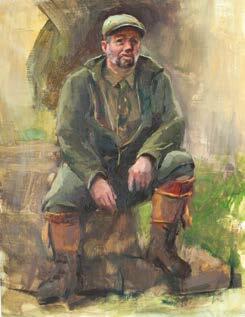 On the second day, we painted model Ross dressed in character – A real Yorkshire man! I didn’t feel the time passing by, I was so immersed in capturing the scene. 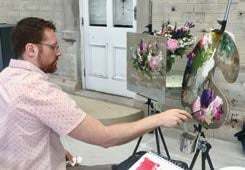 I stayed for the second workshop with Michael Klein, painting florals. I’ve been such a fan of his work so it was like a dream for me to be able to paint flowers with him. The set was Rosemary’s orangery, a stunning place and each student had the most beautiful flower arrangement to work from. In the mornings, we watched Michael develop his own piece, and I had to sit really close to him and see how he handled the paint and his brushwork technique. We all watch videos but nothing compares to the experience of observing an artist responding to his subject matter right in front of you. 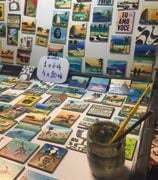 With these workshops, I learnt that the possibilities of painting are infinite! And more: it helped me to find out what is really important to me. I also had the opportunity to explore the area on the days before and in between classes. 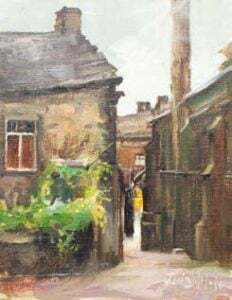 I met old and new friends and enjoyed the camaraderie whilst going to places like Haworth (where the Brontë sisters lived) small villages in the neighbourhood and idyllic places like Malham Cove. I feel truly blessed and thankful. 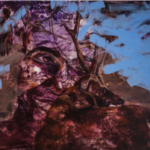 Billy Seccombe is a painter represented by Dacia Gallery in NYC. He instructs painting & drawing at DuCret School of Art in S. Plainfield, NJ. 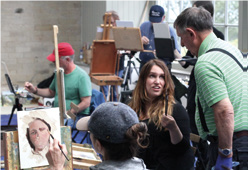 A recent weekend getaway to the Finger Lakes region of upstate New York marked the beginning of a newly found love in plein air painting. With it’s rolling hills and vibrant autumn colours, the region offers a certain peace and tranquility. 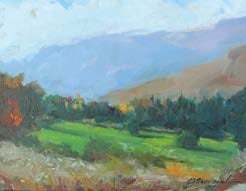 Racing to set up my paintbox at the crest of a mountain top overlooking a valley, I quickly began to apply paint to my small canvas in the diminishing afternoon light. It was exhilarating, electrifying, and I was completely alone. The painting and I were one with nature. The once Native American fishing and hunting low-lands of Cheesequake Park in New Jersey have a tranquillity to it that I find myself returning to as well. There is a calmness here I often seek. It was sparsely populated that Thanksgiving day, overcast and cold. I found myself at one with the marsh land, distant purple-gray hills and sweet ocean air. My paintbox and I connected with the surroundings which can only be described as meditative. The honesty I found in my marks was something only painting from nature can offer. 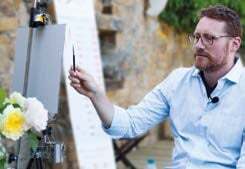 With plein air painting the pressures associated with portraiture quickly dissolve away allowing one to focus instead upon abstract shapes as though large pieces of torn paper. There is a looseness and bravery that come from this knowing. It was one of the most aware, fully alive moments of my life. My words to Michael were, “This is a marathon not a sprint!” and boy was I right. Two 3 day workshops and a demonstration evening over 7 days was no mean feat – but we did it! We had 30 students over the two workshops from all around the world, and 16 flower bouquets to arrange. That, alongside the heatwave we’ve been experiencing in Yorkshire leant itself to a dreamlike situation. One we and hopefully the students too, will never forget! will agree!). A true modern-day Master. My job was to make sure folks had enough tea and coffee, and that they were generally comfortable at the workshop. 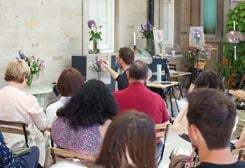 Rosemary had allowed us to use her Orangery to host the workshops. The space is at the back of the Rosemary Brushes workshop and has the most glorious views of our valley. At lunch we all sat outside and we brought out home-made packed lunches and nibbles for the students. It was a relaxed and calm atmosphere. Idyllic some may say. In the afternoons the students painted, working on the same piece over the three days. Michael went to each student time and time again to help and give advice. This indoor set-up was something new for us! With the week before the workshop being National Flower Week in the UK, we were lucky to have the choice of so many beautiful flowers for the set-ups – all at their peak and many from Rosemary’s garden! making lots more videos now. During the demonstration evening (a 3 hour session), Michael showed how he would approach a still-life set up, with limited time. 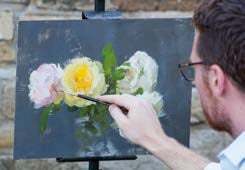 We are blessed to have our workshop where we make the brushes in such beautiful surroundings, and so this evening was filmed in Rosemary’s garden. Overall, it was such a magical week. I couldn’t pick if you made me as to which workshop was better! They were both fantastic, and I am confident the students would tell you the same. I urge you to look at the Masters we have joining us to teach next year and consider a trip to this beautiful place we call home, Yorkshire! Check out the workshop video! I could hear the familiar sounds of a conversation happening in French behind me. As soon as I have a moment to let this wash dry, I turn around to greet a couple who have been watching me paint the Salute church in Venice. I make a joke telling them my concerns “why in the world did I decide to take on such a complicated subject such as this church!” I suppose Sargent was ripley inspiring me. The intricate baroque architecture challenged my ability to simplify yet still capture the feeling of this ornate basilica. These paintings are a visual journal not only reminding me of places I’ve wandered about the world, but more importantly recording all those intangible, unseen experiences that make up who I am. 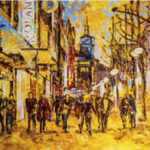 With each watercolour comes an array of interactions had with friends and strangers alike. These watercolours are conversations with ancient patinated architecture, the hammer and chisel of Michelangelo and Rodin, and the friend sitting across from me in the train as we journey from one side of Italy to the other. They represent visual notes of colour and drawing, providing a window into the way I see the world. Each one of these pieces remind me of a time that I was fortunate enough to sit for an hour or two in the complete present moment. They show frustration, problem solving, joy, and triumph. Each time I flip through its pages, I am flooded by so many memories. I can smell the fresh rain in Venice or better yet the aroma of espresso wafting through its streets. I get to relive many beautiful moments that have shaped who I am and I am thrilled to share it all. Richie attended Michelle Dunaway’s and Michael Klein’s workshops here in Yorkshire over the Summer! A new friend for life! Starting 2018 on a different continent was definitely an adventure I’ll never forget! I was fortunate to be able to take a much needed three month sabbatical at the beginning of this year and back pack around South America with two of my friends. Here’s a quick recap. We started the trip in Buenos Aires, capital of Argentina. We visited the Museo Nacional de Bellas Artes which held many favourites of mine, including Sorolla, Monet, Renoir and Mancini. 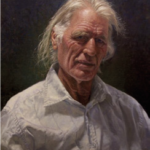 My best mate Jeremy Lipking had been there the year before and told me it was a must-see if I was able to visit. He was right! Wow! We then travelled down to Patagonia, the most Southern part of Argentina. We went on several hikes starting in the town of El Calafate, and explored the Los Glaciares National Park in El Chalten. 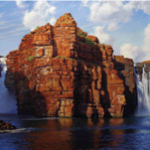 the land of few inhabitants and most beautiful natural forces, formed over millions of years. I thought whilst I was there; a painters paradise. We travelled through the north of Argentina to Iguazu National Park, A UNESCO World Heritage Site. We witnessed the waterfall from both the Argentinian and Brazilian Borders. I know many painters, including my friend, Alexandre Reider (pictured with his wife Eliane and myself ) have painted these waterfalls. We headed through Uruguay and onto the beaches of the Southern coast of Brazil. 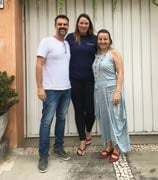 I was able to visit my friends at the Plein Air Studio in Sao Paulo. I’d been told about Reider and his wife through Richard Schmid and Nancy Guzik. We also had a mutual friend in Luiz Vilela (featured in this newsletter). I set up the brushes for two days as a ‘pop up’ shop and I was able to talk through the different ranges with Reider’s students. We’re looking to do something similiar in January 2019, dates to be confirmed – watch this space on our blog! Reider and his wife took us to the most wonderful barbecue restaurant (Churrascaria Vento Haragano) where almost all the art work on the walls was from Reider! Aleandre joked with me and said, ‘Welcome to my gallery!’ – What a place and incredible food! We made sure to stop at the Pinacoteca do Estado de Sao Paulo whilst we were there. The Pinacoteca has a wide range collection of Brazilian Art works and many 19th Century European Paintings too. It was certainly worth taking the time to visit, even if only for the building itself! Then we headed to Rio de Janerio for Carnival! The streets were filled with locals and tourists dressed to impress. We visited the Sambadrone one evening and each corner you turn in Rio there’s the most incredible street art. A highlight of my trip was taking a helicopter ride around the Christ Redeemer. Only then do you get an idea of the size and grandeur of that magnificent statue. We left Brazil and headed to Calama in Chile. 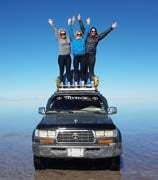 From there we travelled through the Atacama Desert into Bolivia to Uyuni. We woke around 4am to travel to the Salar De Uyuni, the Salt Flats (pictured above). After Patagonia, this was my next must-see. I also saw for the first time the breeding ground for pink flamingos – tens of thousands of them! The next stop was to be La Paz. This unique city was full of the hustle and bustle of everyday city life. 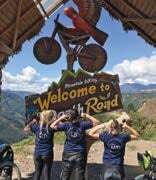 We managed to squeeze in a day trip cycling down Death Road whilst we were there too. (pictured above). I ended my trip in a small village called Rurrenabaque, North West of Bolivia near the border of Peru. I lived in an eco-village for a week in the Amazon Rainforest! Another must-see. South America: an incredible continent offering so much variety. The art is vast and I can honestly say, I’ve only just scratched the surface with this trip. I’ll be back! 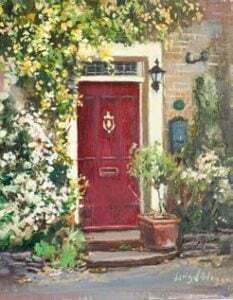 Rosemary & Co welcomed Michelle Dunaway and students to paint within the grounds of the workshop and around the Yorkshire Dales. 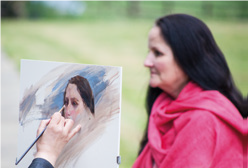 In the month of June 2018 we welcomed Michelle Dunaway and a group of students to Yorkshire ready for a workshop on the figure outdoors. Each day we headed to different locations and placed a model in what I would consider, the most beautiful landscapes. Close your eyes and think Pride and Prejudice and you’d be almost there. Michelle had asked that I make it timeless – so that’s what we did! 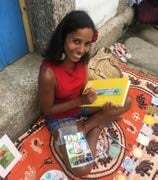 Each morning the students arrived at the Rosemary Brushes workshop early and eager to go out and paint! Plein Air is tricky at the best of times, but with Yorkshire’s seemingly unpredictable heatwaves of late – this was set to be a challenge! Fear not I thought, folks on these workshops are usually most understanding and roll with it. And that they did! The weather turned out to be a friend not a foe. We were actually wearing shorts asking for cold drinks, not piling on coats and hugging a cup of hot chocolate! The students came to me throughout the week to let me know how much they loved the area we are lucky to call home, and also to tell me how much they were learning from their maestro – Michelle. I have to say, the landscapes I can take very little credit for – Yorkshire is beautiful and I’m the one who’s lucky to live here. 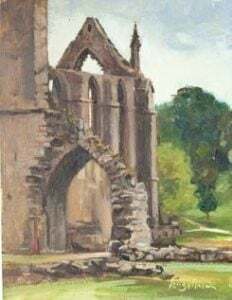 Two of the days we visited the grounds and painted amongst the ruins of my favourite estate, Bolton Abbey. To think that Turner was painting in the same place as us some two hundred years ago gives me goose bumps. I always think about how things must have been for him as a painter back then. He didn’t have the luxury of squeezing any colour paint out of tubes, or of the most lightweight, compact easels on the planet. Turner didn’t have over three thousand Rosemary Brush ranges to choose from either! But then I think – if he did can you only imagine what he would have painted! How could he have been any better!? Now, I know I’m dreaming here, but quite honestly, it makes me think of what our masters of today have at their finger tips. Never the less, you can have all the tricks of the trade at your finger tips, but that does not mean you can sit in front of the most beautiful ruins with a model and paint like Michelle Dunaway. That is talent, years of hard work and a million brush miles. of these workshops, I’d urge you to do so. The teaching ability is sensational, the general running of the workshop is by me (so it’s a little nuts, but it’s sure to be fun!) 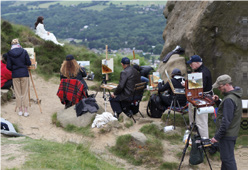 and of course, I have beautiful Yorkshire to thank for the most incredible backdrop, a painters paradise. We tried to capture a slice of this workshop on Youtube. Check it out! By popular request we have added two extra sizes to our Series 40. Earlier this year we launched sizes 8 and 10 as additionals to the original size 12. We will release more larger sizes later in the year. Search Series 40 on our website for more info. As much as I love photography, I want my paintings to be expressions in their own right. 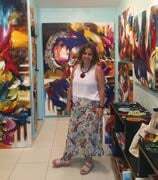 I´m not an abstract artist, although I love abstract art. I am inspired by shape, light and form and want to include these in my work. 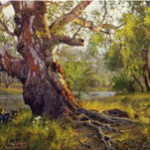 I love realistic art but I have been looking for the sort of freedom which allows a liberal dollop of artistic licence! I find myself caught between the desire to render an image faithfully and yet abstract it, play with it and create something new. Such comments (as above) started a journey to capture the essence of what inspires me about an image in the first place but allows me to express something that is not in the scene but speaks to me in my imagination. The brushes I used before did not help me achieve this. They splayed when I needed them to hold their shape, they dripped paint, the outer hairs would rub off – where did they go? – and they shed loose hairs at the most inconvenient moments! Working with acrylics I had to remove these before the paint dried. A lot of unnecessary effort was expended while I compensated for all of this. Sometimes I just wanted to complete the picture and leave any playing with the image and experimenting for another time. There comes a point where the initial impulse dies and the painting loses spontaneity and looks overworked. I wanted to avoid this at all costs. That’s why I was thrilled to discover your brushes. Painting has become so much more of a pleasure, as I have brushes that work with me, not against me. They have freed up energy and thinking time – sometimes only one brush-stroke is enough to complete a figure or suggest a window. They make a statement. 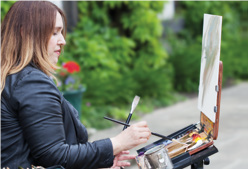 Your brushes support a creative process where I can paint realistically but take artistic licence where I choose to. Needless to say, I have more confidence to experiment and take more risks. I´m enjoying a new freedom in my work. 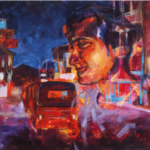 My latest paintings have been inspired by a visit to Sri Lanka this year. Just as our memories merge and blend the people we meet and the places we discover, the images do the same in my work. The colours are as intense as the brightly coloured temples, the smell of the spices and flowers. My sketchbook, diary and camera travel with me wherever I go. I cannot wait to return to Sri Lanka one day with its enormous variety of landscape, animals and nature. Thanks to my photographs and sketches I can capturequick impressions but this is not enough for me. Painting helps me not only to re-live the experience but explore the images. The result is an expression of something personal, a mini-adventure with brushes and paint that a camera cannot capture. We’ve introduced a new Squirrel Blend to our ranges this Summer. The Series 38 Pointed Oval Wash is a blend of Squirrel hair and Synthetic fibres, giving what we believe to be the best of both worlds. For many, Squirrel hair is the dream watercolour brush for it’s water carrying capacity. However, some say that although it holds an immense amount of pigment, it is a difficult hair to control with it having little to no ‘snap’. It seems a shame to only use your Squirrel brushes for washes and backgrounds if you consider them unmanageable. That is where our new Squirrel Blend comes in handy! The Synthetic fibre that runs through this brush will allow for more control, more snap and also lower the price of a Pure Squirrel Brush. You’ll still have the Squirrel water retention in there, and of course, it’ll be somewhat softer than a 100% Synthetic Brush. Our new Squirrel Blend works well in watercolour, for silk painting, pin striping, lettering, calligraphy and more. We have introduced the Oval Wash as the first shape, in sizes 1/2˝, 3/4˝ and 1˝ with more shapes to be introduced this year. For cleaning, you can rinse them in water and lay them on their side to dry. They may go fluffy when they dry completely, but once you get them in water again they will be good to go! Search Series 38 on our website for more info. For almost two years Rosemary and Andrew Tischler have been working on creating a new range, The “Tisch”. Here’s the story. I’d been looking at Andrew’s work on YouTube for some time and noticed he had been mentioning our brushes, in particular our Series 25, 1˝ Angular. Though Andrew liked it, he wanted something he could love because it didn’t quite do what he wanted it to do due to his unique brush strokes. So, Andrew got in touch and said that he wanted to make certain brush marks, and wanted the range to be available to his followers in all different sizes. Firstly, Andrew drew me pictures of the angles of the brushes he wanted me to create. I took those pictures and made a set from them. I explained to Andrew we probably wouldn’t get it right first time, but I needed to know what was wrong with them to get it spot on. Again, Andrew trialled the set, told me we were 90% there but he still needed more of a curve on them. When you see how Andrew works, you’ll understand why that curve is essential. sense of reality across many genres. From there we expanded all the sizes and made from ⅛˝ right the way through to a 1˝ available on the long handle only. 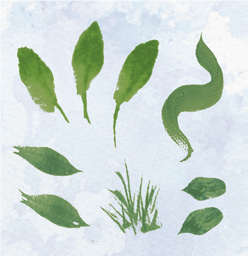 As a brush maker, it’s really so lovely to think we can actually design something different that works for that artist, who a lot of artists around the world are following. 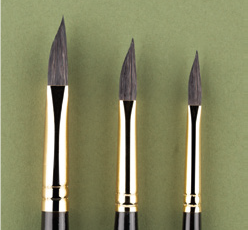 This range will help Andrew and his followers make brush marks easier and in a small way, I feel to have contributed. Images courtesy of Andrew Tischler.